Current Affairs News | How Coaching Institute can Help Crack Civil Service Exam? Home > Blog > How Coaching Institute can Help Crack Civil Service Exam? 02 Aug How Coaching Institute can Help Crack Civil Service Exam? Cracking Civil Service Exam is a challenge. Among lakhs who apply only a few hundred get selected. Becoming successful in this exam needs strategy, guidance and dedication. Not all are virtuous in their intellectual and mental capability to tackle this exam alone. Many need guidance. You may have chose civil services as your career option coming out fresh from your graduation or quitting your current job. In this scenario, your knowledge is restricted to your graduation subjects or your work domain. For Civil Services Examination (CSE), diverse knowledge is required. Gaining such knowledge in a short period of time is difficult. Here is where a coaching institute will be helpful to you. At any level of education, schools, colleges or institutions coach the student to acquire knowledge and skill for a better career prospect. It is the same with IAS coaching. They impart the required skills in you to clear the exam. Over the years the importance of coaching to crack the CSE has grown manifold. IAS Coaching institutes gained reputation for churning out the potential candidates for clearing the exam. They have done this through innovative pedagogy. As you know, IAS exam requires understanding on various domains with an analytical mind. Acquiring these skills in a short-period of time is made possible by coaching institutes. But, where do you look for such institutes? 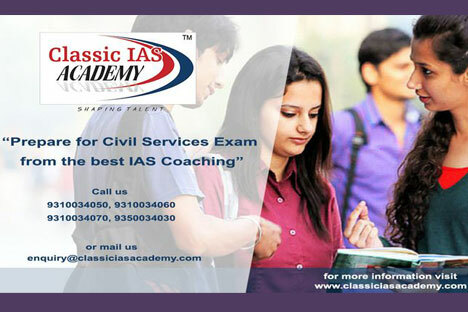 The place to look for ias coaching in the country is in Delhi. The capital city has become a hub for ias preparation. Here you can find many institutes that cater to different requirements of an aspirant. But to get best ias coaching in Delhi you must first identify the best institute for a better prospect in the exam. But a question might have risen in your mind. How exactly coaching helps me? Syllabus Completion: Often the common complaint among many ias aspirants is that they are unable to cover the syllabus given by UPSC. It is here coaching institutes help you. Also it is here the best coaching institutes differ from the ordinary like Classic IAS Academy. Best ias institutes teach you the entire syllabus of the examination in time bound manner. This will help you a lot in boosting your confidence towards the exam. You will be in an advantageous position to clear CSE than those who did not cover the syllabus. Knowledge Delivery: Covering the syllabus is one thing and delivering knowledge that makes you understand is another thing. Coaching facilitates such delivery by subject specialist and domain experts. Best coaching institutes hire the services of experienced faculty. They deliver lectures that make you understand complex issues easily, impart basic knowledge and aid in your preparation. Doubt clearance: A lingering doubt robs you of a goodnight sleep. It is better to clear it immediately. For freshly initiated ias aspirant many doubts arise. Individually if you try to solve them it eats into your preparation time. Instead, if you join a coaching centre, the faculty of the centre will help clear your doubts. Here too best institutes stand out and Classic IAS Academy is the first & only institute in providing such facility apart from classroom studies. Mentorship and Guidance: The long drawn preparation for CSE will at times exhaust your energy. In those times you feel low and want to quit. Here the guidance of a coaching institute will help you. They mentor you, motivate you and put your worries to rest. They respond to your issues with cordiality and empathy. They try to solve your academic issues to the best of their capabilities. Study Materials: Study materials are often used as supplementary resources to standard book. But, good coaching institutes provide study materials that can be used as main sources for your preparation. Study materials with well curated content and is designed for ias preparation only are needed for your preparation. These can be provided only by the best and well reputed institutions. By associating with a coaching institute, you can get these materials along with your coaching or else you can purchase them from them. Nowadays, study materials are being provided online too. It is a convenience that is becoming common in this digital age. You can read anywhere possible with e-materials. Practice Tests: Coaching institutes helps you test the knowledge you gained. They conduct practice tests regularly. Here you can compete and evaluate yourself. A valuable feedback on your performance by the experienced faculty is an added advantage if you join a coaching institute. The scope of this increases if it is an institution of high reputation like Classic IAS Academy. Taking into consideration the above mentioned criteria, one such coaching institute that provides best IAS coaching is Classic IAS Academy. With an impeccable track record, no doubt Classic IAS Academy is the best ias Academy in Delhi. The teaching faculty of the Academy is the best in the country. The Academy values the time and money of the students like you so much so that it completes the syllabus on time. You don’t need to search for many resources for your preparation. The study materials provided by the institute are up to date and concise. Keeping in mind the needs of the economically weaker sections of the society, the Academy offers scholarships for coaching. Compassionate counsellors at the academy guide the students and help them avoid pitfalls. Overall the academy is humanitarian and puts the concerns of students first. Keeping aside whatever written here, in the end it is you who has to take the decision. It is you who has to utilise the many facilities provided by the coaching institutions. It is you who is dreaming to become an IAS officer. It is your right to judge whatever written here. Be rational and take the right call. So, it is time you take that final decision and make it worth remembering forever.